(Sept. 4, 2013) -- Faculty, staff and students gathered in Sombrilla Plaza on the UTSA Main Campus on Wednesday to celebrate the launch of First Light Christian Fellowship's inaugural book, "Spiritual Journeys of Christian Faculty and Staff." The book includes 27 Christian testimonials and is a first for the organization. The launch party opened with Christian music from Chi Alpha, a registered Christian student organization. Kerry Kennedy, UTSA vice president for business affairs offered a brief welcome. Sonja Lanehart, UTSA Brackenridge Endowed Chair of Literature and Humanities, read from her testimony, "I'm Tired: A Manifesto for Faith." Jimmie Neff, UTSA facilities planning analyst, then read from his testimony, "The Birth of a Christian." The launch party closed with a prayer from Kennedy and the singing of "Amazing Grace." In 2008, UTSA faculty and staff formalized the First Light Christian Fellowship. In 2009, the organization hosted an inaugural dinner meeting, welcoming nearly 100 faculty, staff and students. Since that time, the registered organization has grown and continues to meet weekly. Members learn from each other and encourage each other through biblical teachings, scriptures, prayer and personal testimonies of faith. "Our purpose is to reach those people who are reaching out to God -- who need Him," said Kennedy. "The book does that through stories, and at the end of the book it does it very specifically." First Light began working on the book in fall 2012. Initial drafts of the book's 27 testimonies were completed in January 2013 and the book was subsequently prepared for publication. Wanda Guntz, UTSA administrative services officer, worked for months to ensure the book would be completed. "This process has been extremely rewarding. It was interesting to learn about the people in First Light and to see all the amazing stories," said Guntz. "We all come from diverse backgrounds, but there are definitely similarities in our lives when Christ is present and he reveals himself, whether in times of joy or tribulation." 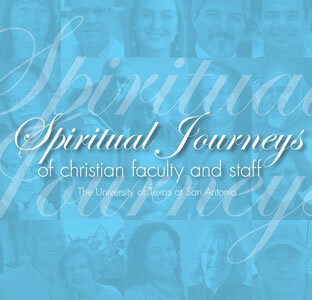 "Spiritual Journeys of Christian Faculty and Staff" can be purchased at a discounted cover price through the Office of the Vice President for Business Affairs by contacting Wanda Guntz at 210-458-4201. It also is available on amazon.com and will be available soon in the UTSA Bookstore. In the future, First Light hopes to engage local church bookstores, Family Christian Stores, and Barnes and Noble to carry the book. First Light Christian Fellowship meets 7-7:45 a.m. each Wednesday in the Biosciences Building Loeffler Room (3.03.02) on the UTSA Main Campus. The book's authors are available to speak at UTSA and in the community. To learn more, visit the First Light website or contact Wanda Guntz at 210-458-4201.